..... Click the link for more information. , class Liliopsida, order Bromeliales. 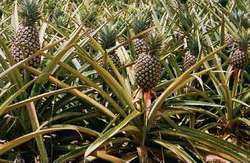 People are actually growing pineapples in their houses and yards up north. www.EdibleLandscaping.com is shipping more and more exotic fruits to all kinds of people. 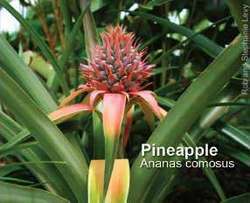 Each plant has over 200 flowers, the individual fruits of these flowers join together to produce what we call a pineapple. The tough middle stem contains bromelain, an enzyme that digests protein. This tough stem can be broken down in a strong blender like a Vitamix. Both root and fruit can be eaten. Great antiinflammatory. Used to help macular degeneration (eyes), digestion, sinus, arthritis, energy, bones, teeth, gums, blood clots, nausea, morning sickness. Stems used for cancer. Some people “fast” on nothing but pineapple for several weeks to expel worms, parasites and cleanse the body. Also great sugar substitute. Ananas sativus. A perennial plant of the order Bromeliales with long, swordlike, usually rough-edged leaves and a dense head of small abortive flowers; the fruit is a sorosis that develops from the fleshy inflorescence and ripens into a solid mass, covered by the persistent bracts and crowned by a tuft of leaves. 1. An ovoid, imbricated finial.